Despite the effects of red tide, sea turtle nest numbers are continuing to grow, hatchlings are making their way to the water, and excavations are being done by patrol members on a consistent basis. As of July 27, the Boca Grande Sea Turtle Association reported 614 Caretta caretta (loggerhead) turtle nests on the island. There were 561 reported false crawls (when a turtle comes up onto the beach but does not lay a nest). One Chelonia mydas (green) turtle nest has been reported so far this year. 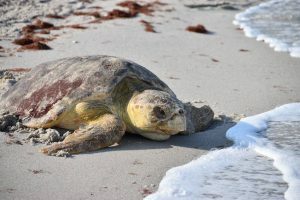 “The Kemp’s ridley are the rarest species of sea turtle and are critically endangered, so every one that has washed up on our beach over the past month is exceedingly painful and a tremendous loss,” said a patrol member for the organization. A number of deceased hatchlings were found washed back onto the beach on July 20. If you’re on the beach and see what you think is a red tide-intoxicated baby sea turtle, the best thing to do in that situation is to call the Florida Fish and Wildlife Conservation Commission (FWC) hotline (888) 404-FWCC and report it. FWC will then contact the BGSTA to pick it up. This allows FWC to track and document every element of the stranding, and they will work with the rehabilitation agencies to get the hatchling to the place that is most appropriate. It is advised that you not touch a hatchling, but if you think it is in distress, gently place it in a bucket with some damp sand, cover it with a towel, and wait for a volunteer to pick it up. The BGSTA is looking for some kindhearted folks who live locally, have a boat and might be interested in transported stranded turtles to the Clinic for the Rehabilitation of Wildlife (CROW) facility on Sanibel Island. There are no turtles in need of transporting at the moment; this is a request for the future for when turtles are rescued. Currently, transporting a turtle to CROW takes about four hours (round trip) by car, so the trip would be much shorter by boat and less stressful to sick or injured turtles. This is a fairly rare event, so it would not be a regular commitment. Optimally, the organization would like to find a few boaters that volunteers could call in an emergency. If you come across a sea turtle that is stranded or dead, or if you see someone disturbing a nest or turtle, call the Florida Fish and Wildlife Conservation Commission (FWC) at (888) 404-FWCC.